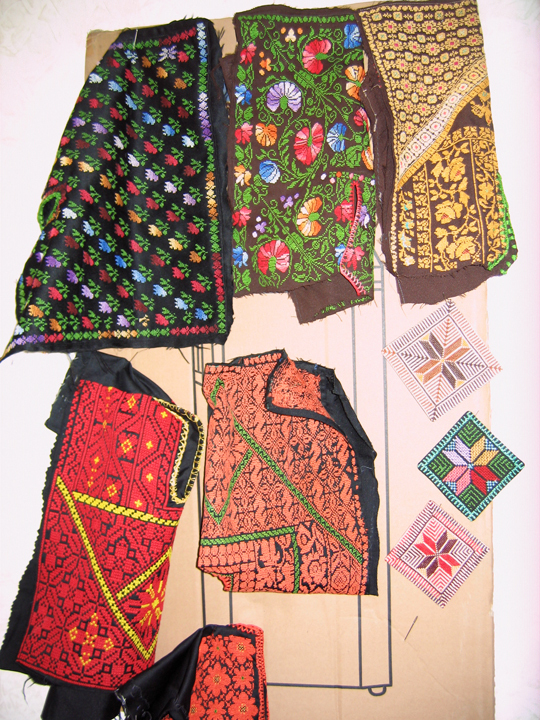 Palestinian embroidery dress yokes. 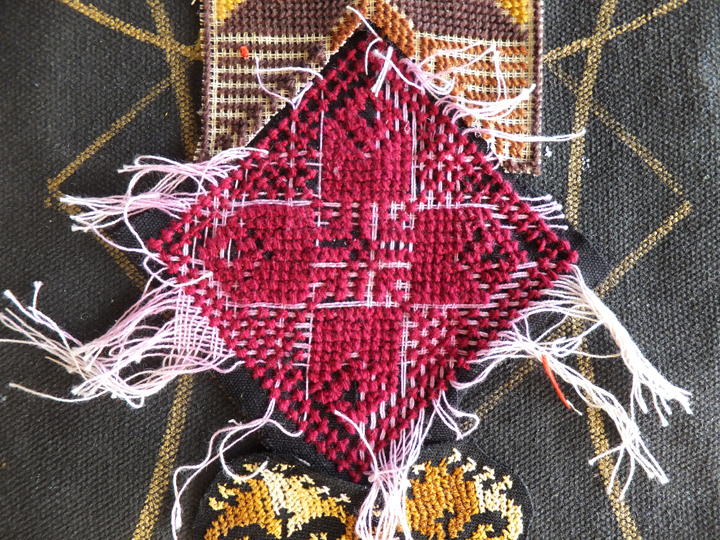 Each traditional pattern comes from a distinct village. 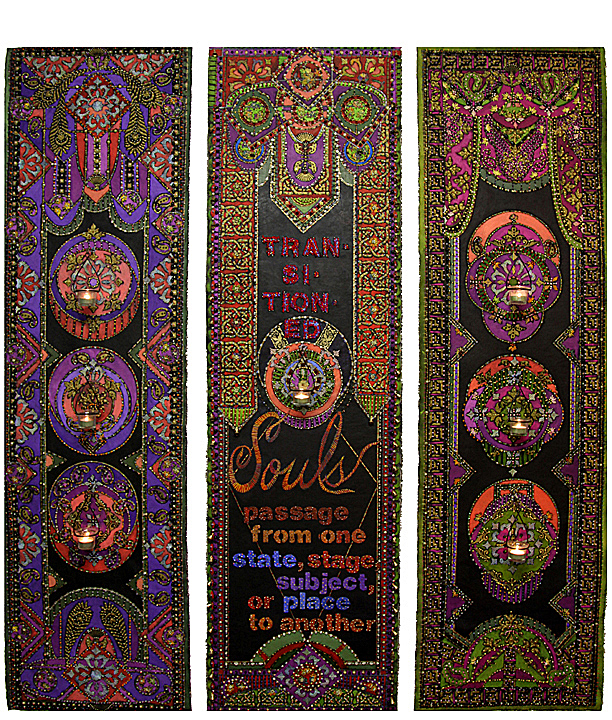 Top left: (black background with flowers) Al-Dawaima, Hebron; center (with brown background & flowers) Beir Maheer, Ramla; right (gold & brown) Beit Mahseer, Ramla. Bottom row: left (red) Jeruslaem; center (orange) Jerusalem. 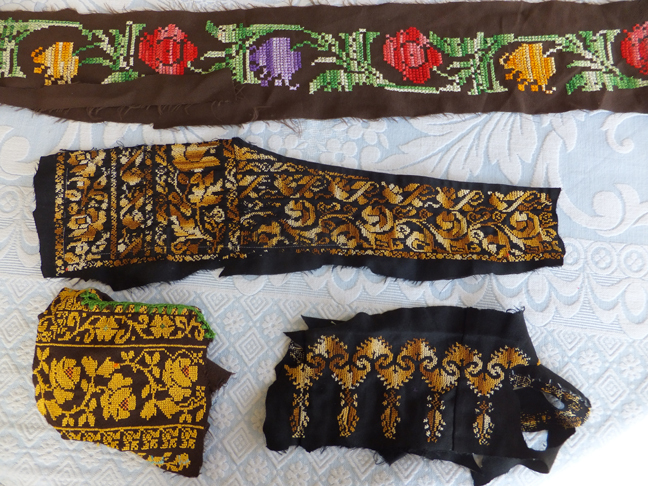 Embroidery patterns, top row: Contemporary design (no village); Center row, Jerusalem; bottom left, Jerusalem; bottom right, Hebron. We still have months of work to do, sewing and beading. Yet, it is slowly (but surely) coming together! …What do you think? 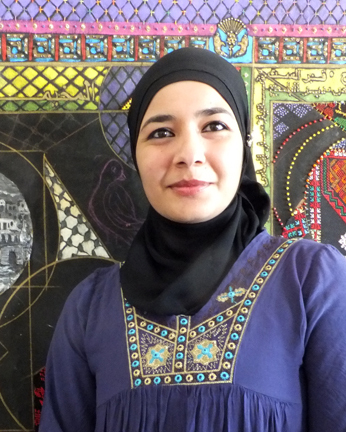 The primary artist with whom I’m working on the 7 Women’s House Keys salon artwork is Hanan Al-Khalidi. 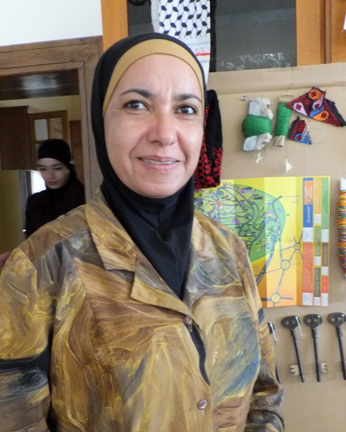 Hanan is an elementary school art teacher in Zarca. She is married and has three lovely daughters in their early twenties. I hired one of Hanan’s daughters, Amira (“Princess,” in Arabic) as my secretary. I recently changed Amira’s title from secretary to Embroidery Salon and Art Exhibition Manager. Without Amira, communication would be at a standstill. As I mentioned previously, Amira was awarded a bachelor’s degree in linguistics and is fluent in Arabic, English, Korean and Japanese. She is also a highly proficient organizer. My intent with the art salon was to pay the professional women embroiderers an amount that more than compensated them for their work. I severed ties with the original person I hired to help organize the art salon after being informed that he was taking a commission (of over half) out of the amount the women were being paid. During the two art salon sessions I held in my apartment, prior to learning about the “commissions,” one of the attendees, Majedah Abd Al-Kader, and I became friends. 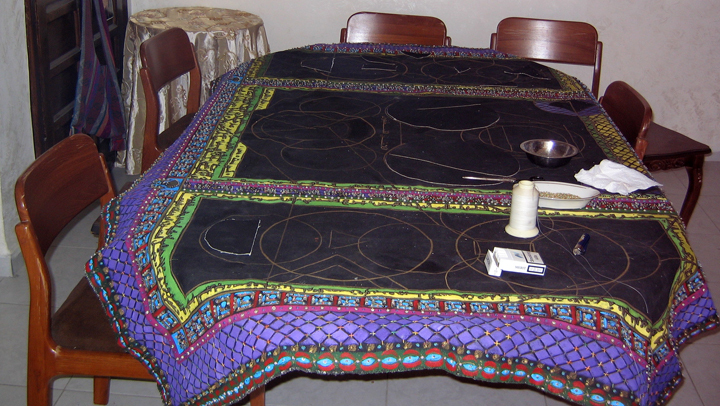 The work Majedah did on the canvas exemplified her exceptional design and embroidery skills. Majedah owns her own shop, Grand Mother’s Dress, and has been embroidering professionally for eighteen years. Two people who have been very supportive of all of my efforts are Raheem (photographer Abed Al Raheem Al Arjan, see earlier post entitled: “Getting down to art business”) and artist Mohammad Abu Zraiq (see earlier post entitled: “Tribal Identities”). 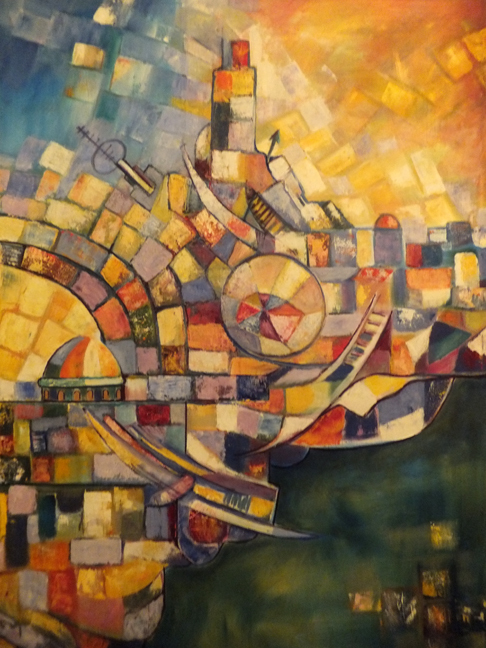 Without the support and friendship of Hanan, Amira, Majedah, Rheem and Mohammad Abu Zraiq, the art salon and exhibition would have become a “pie in the sky dream.” Thanks to them, the dream is manifesting as reality…! I can imagine Sherlock descending dark stairways at night and disappearing into unobtrusive, barely visible doorways. Possibly my association of this tv show with Amman is in the intrigue and mystery of the age-old stairwells, walkways and buildings. 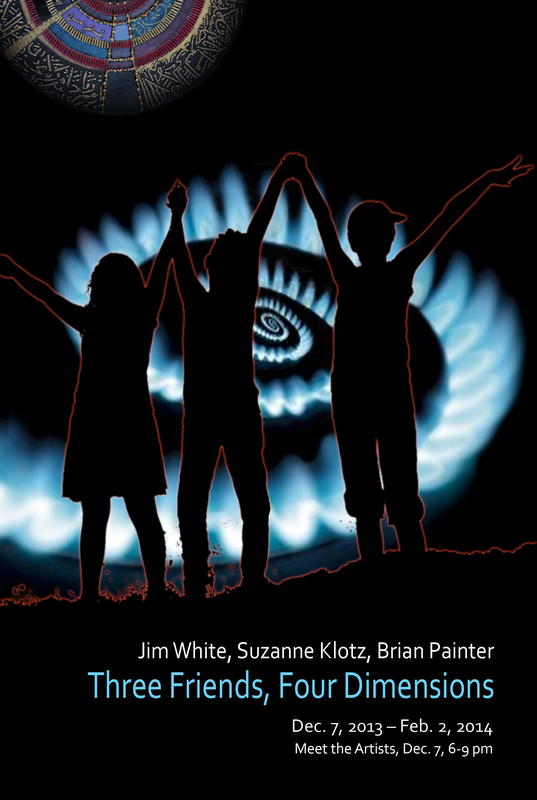 They seem to capture and “possess” the energy of the people who frequented them. 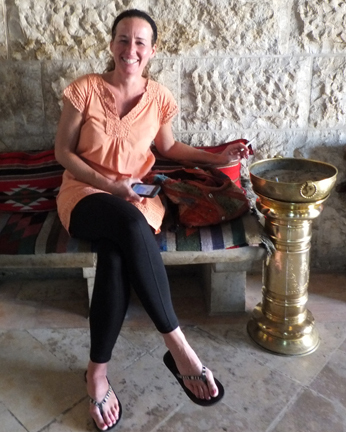 Although I have no familial connections in Jordan, I do have a tribal identity that I am very grateful for. 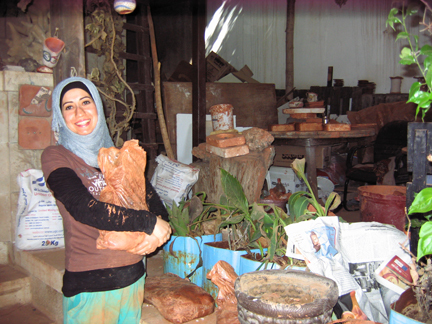 My tribe is other artists, whether in Jordan or anywhere in the world. 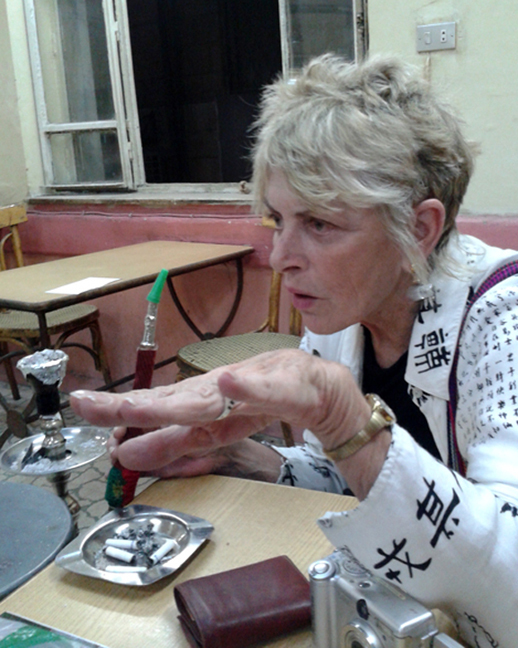 The life experiences of the artists I’ve met in Jordan are as intriguing as their art. When I return home I may do a work of art on each of them. 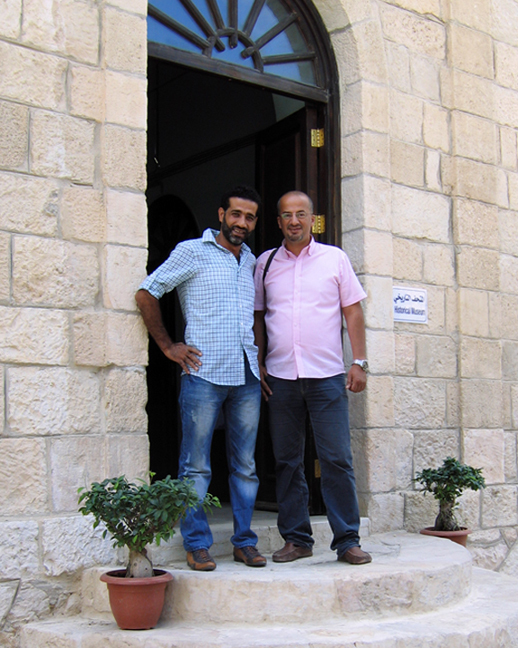 The artist and well-known writer who escorted us to Abu Hay’s studio was Mohammad Abu Zraiq. 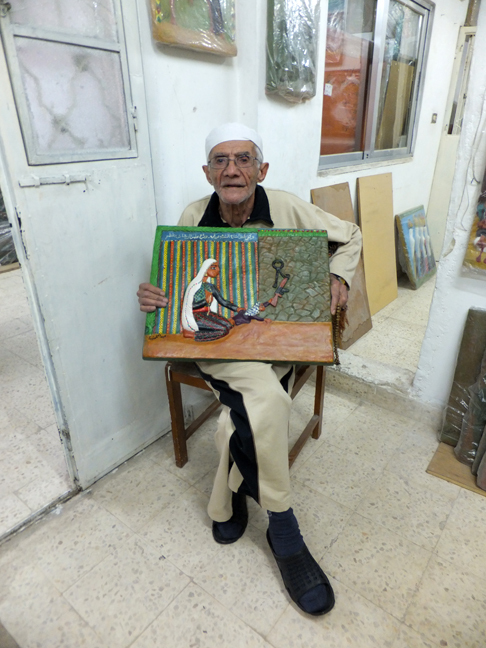 After visiting with Abu Hay we went to Mohammad Abu Zraiq’s studio in his home. 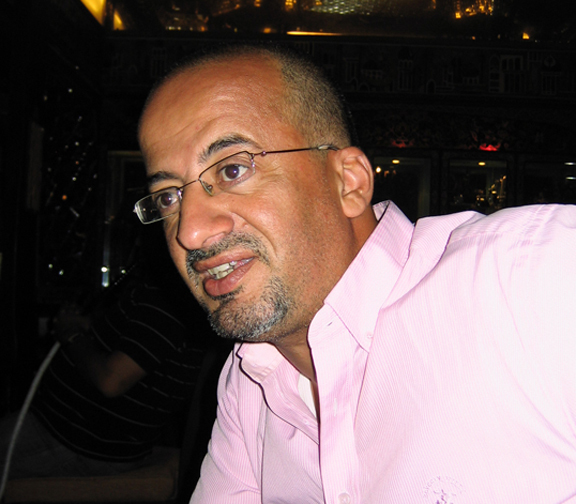 Mohammad Abu Zraiq has ten published books in Arabic about the arts and is also a poet. 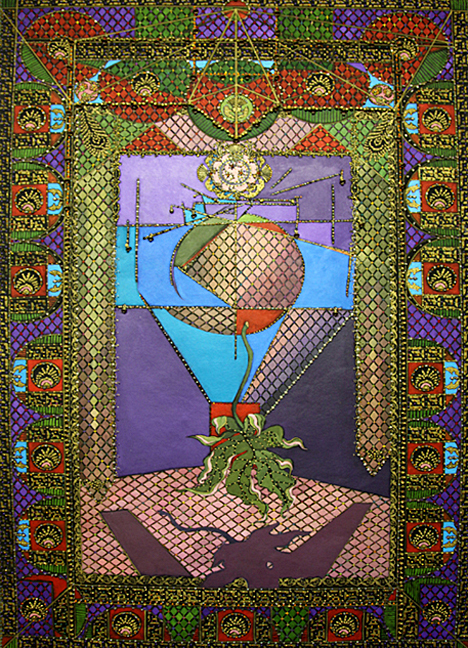 Two of his books are used in higher education as Fine Arts textbooks throughout the middle east: Graphic Art (for Foundation art students) and an art history text entitled: Art from the Beginning of Painting to Now. 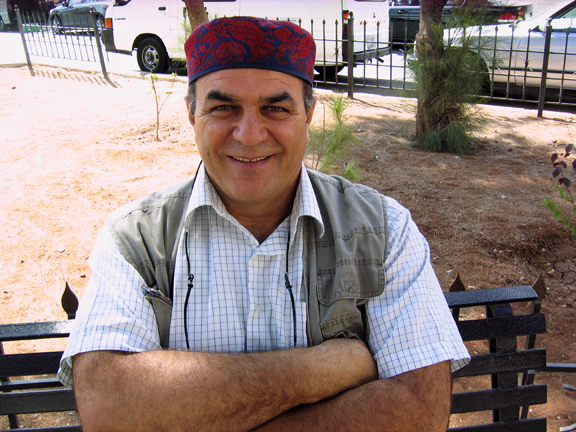 His other books include: Dialectic about Art, Tawfiq Alsaid: His Life and Art, Shamoun, and About 21 Artists in Jordan. 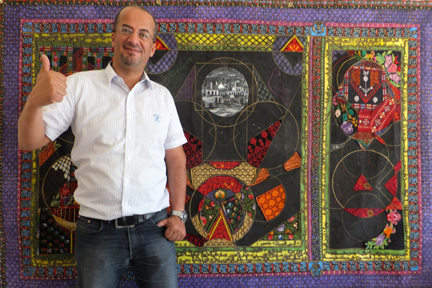 He is one of the most respected art writers in the middle east. 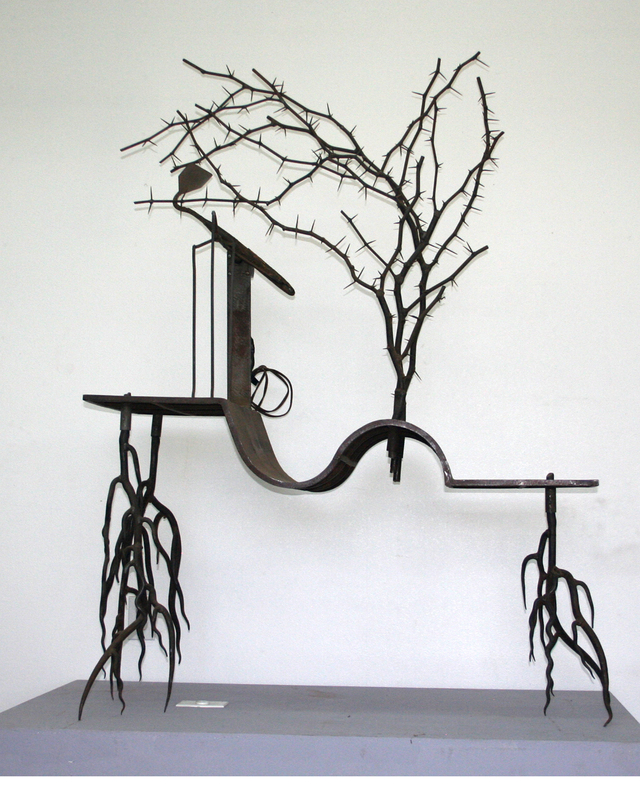 Mohammad Abu Zraiq, a self taught artist, has been a teacher for many of the contemporary artists in Jordan. As a child he painted murals on the interior walls of his home using mud mixed with found pigments: washing blue (detergent) and toilet cleaner for cobalt, mud for white, beet juice for red and turmeric for yellow. At eighteen years old he walked from Jericho to Amman, eventually settling in Hetteen refugee camp near Zarca (population 90,000). During his years in the refugee camp he made great contributions to the education of the children including establishing a library. 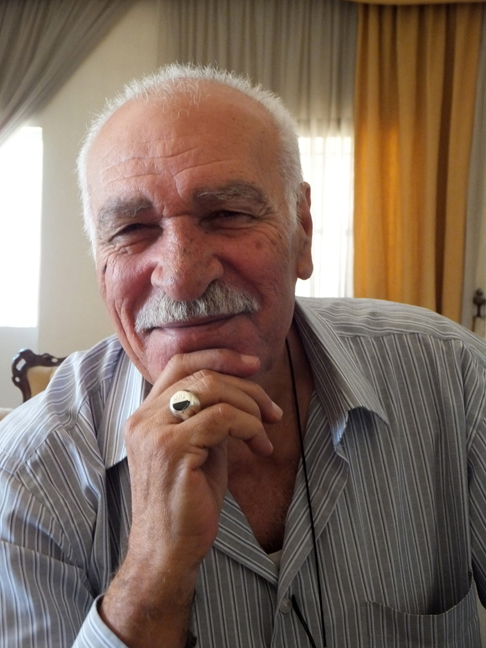 After retiring from teaching with UNRWA (United Nations Relief and Works Agency) in the camp he moved to Amman in 2001. 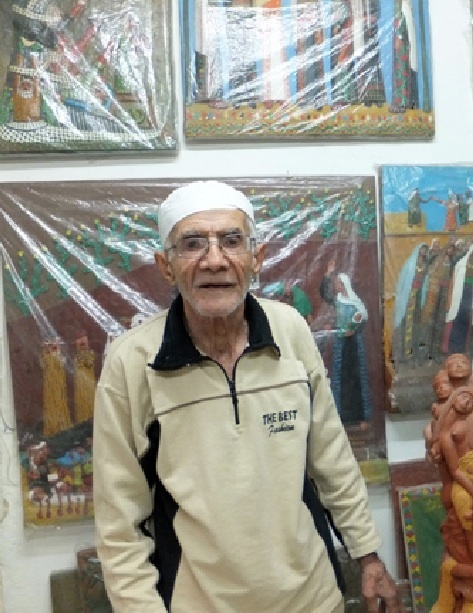 His life experiences, similar to many Palestinians in Jordan, have been filled with hardship and deprivation but, in spite of this, his love for people and life shines through his art, his memories and in his very presence. 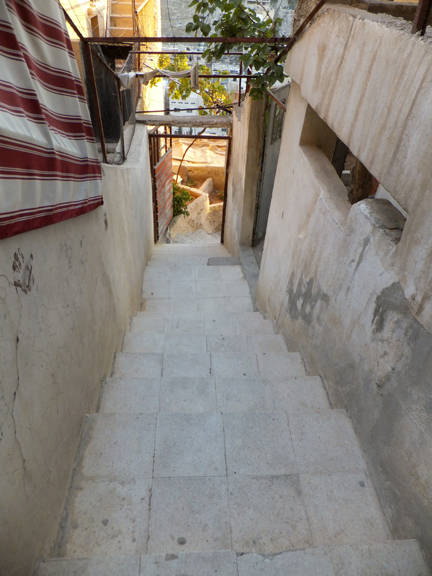 The stairs leading downward to Abdul Hay Mosallam Zarara’s studio get progressively smaller. The reduction of size is disconcerting. I have had recurring dreams about steps for years and I’m finally living the dreams. In my dreams the steps are stone, they differ in height and fade off into nowhere at great heights. The stones on Abdul Hay’s steps are worn to a shine with concave curves in the center. The steps resemble the marble on the Pieta where millions of people have touched the top of the foot of the figure of Jesus. Many of the steps in Jordan look similar. They are a physical record of the passage of millions of lives and history. Anyone who is eighty years old, in poor health and blind in one eye, like Abdul Hay, and climbs these steps deserves a huge medal of courage. I was honestly ready to retrace my tracks at one point, but thank goodness I was too discombobulated to turn around on the narrow step. On the way down the stairs, we (Ahmad, Tamimi and I) were intercepted by a well known-artist, Mohammad Abuzraiq, who escorted us to Abdul Hay’s studio. Abdul Hay greeted us at the door of his studio, invited us inside and served us coffee. The first question he asked me was, “Do you like Jordan?” After replying that I like Jordan a lot he asked why. I replied, “I like the people. They are wonderful and so welcoming.” He then said, “Yes, people. Heaven can’t be heaven without people. Who would want to die if people aren’t in heaven?” Abul Hay’s reply sums up my beliefs in a nutshell. 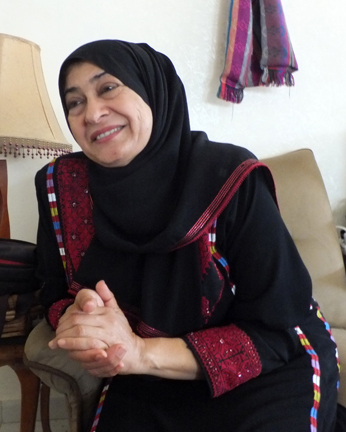 People made it possible for me to come to Jordan and people are the reason I’m in Jordan, more specifically: the Palestinian people. Abdul Hay is the “star” of all the artists I’ve met in my lifetime. 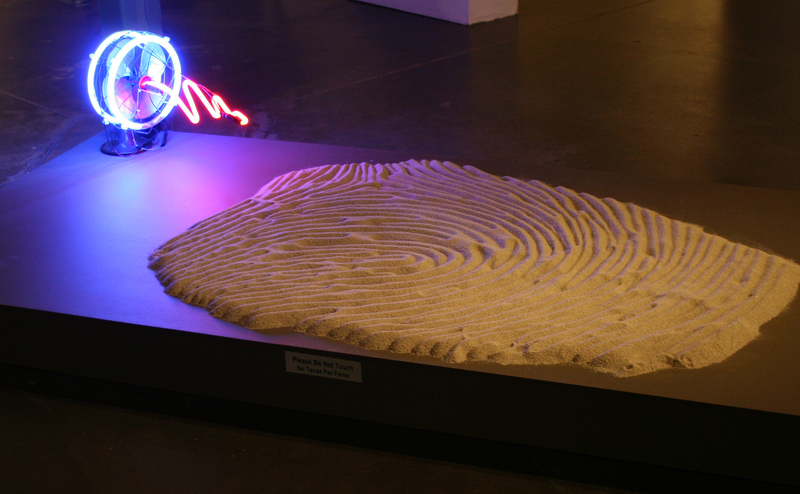 Throughout all of his years of working consistently on his art he has never once compromised his ideas. This is probably the only reason many people outside of Jordan and a few places in the middle east aren’t aware of his art. His art meticulously documents the military occupation of Palestine, and the traditional and cultural history of Palestine. After viewing his three-dimensional paintings he told me he’s been very sick for the past two years, unable to work and has lost his sight in one eye. He creates the three dimensional impasto reliefs for his paintings by smashing up tree roots in a palm-sized wooden bowl with a wooden stick that looks like a knot in a root. I noticed one of his paintings is about Rachel Corrie – a documentation of her death by military bulldozer and a commemoration of her contributions to Palestinian human rights. Abdul Hay told me he contacted Rachel’s parents a couple of years ago and told them he wants to give them the painting. He said they told him they would come to Jordan to pick up the painting and he is waiting for her parents to arrive. The painting is wrapped in plastic, ready to go. If any readers know Rachel’s parents please let them know Abdul Hay is still waiting for their arrival. The days and nights have converged into each other since moving into my apartment a month ago. Tonight is the first night I’ve been home at dinner time, 9 PM, and the first time I prepared a real dinner. 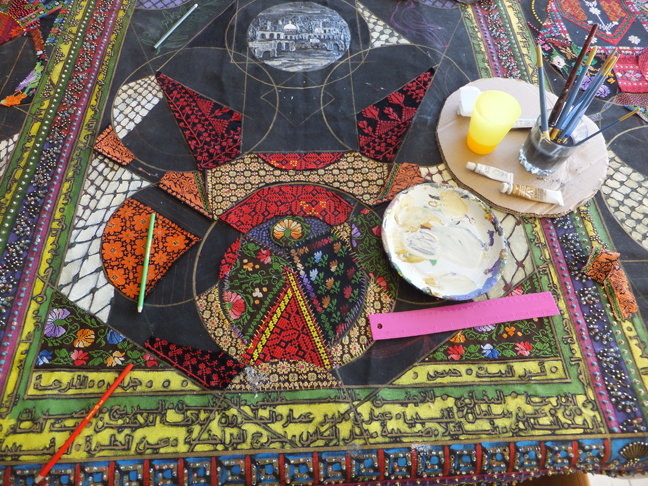 I have now finally narrowed down the women who will work on the canvas: Hanan, five women embroiderers and myself – a total of seven. Everything and everyone is falling into place and my art salon women will be embroidering on the canvas before I know it! Prior to Ahmad’s visit, my Arabic vocabulary had increased to four words. After his whirlwind visit, my Arabic vocabulary has decreased to three words and, I’m not even sure what my name is. 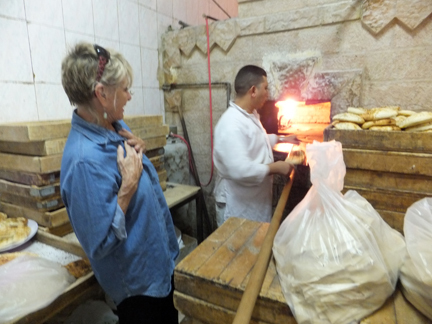 I visited so many artist’s studios, saw numerous art galleries, traveled to many places outside of Amman and had argileh and coffee with many people in too many cafés to mention. I’ve learned to communicate fairly well with hand gestures and sketches, although sometimes the communication gets garbled. My barber’s name is Ahmad, not Yosef. Yosef is a Syrian friend of Ahmad’s who is a barber in Syria. Due to the situation in Syria, Yosef brought his son Khalid to Amman while he is visiting with Ahmad in the barber shop for awhile. The artist Muhammad Abu Aziz took a photo in a mirror of me talking to another artist, Iyad Kan’an. The photo reflects the “distance” in my understanding of conversations. My lack of ability to communicate in Arabic hasn’t really been a problem, thanks to the existing local cultural mode of developing relationships and conducting business here. The precursor for all social and business interaction is drinking coffee or tea together. 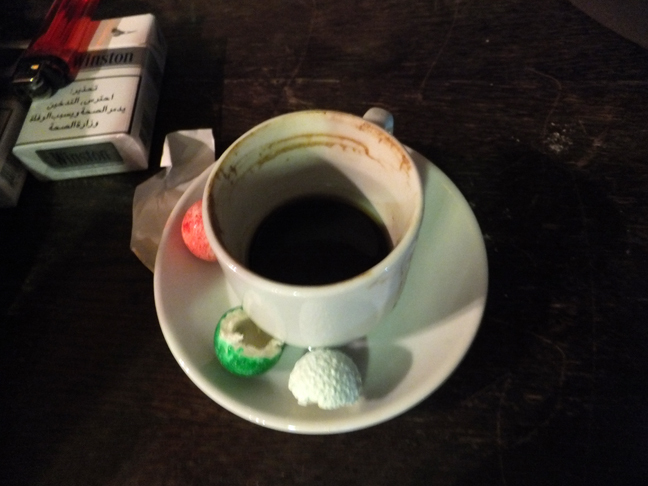 Appointments generally start at the prearranged time but morph from pleasant conversations about daily happenings, to physically moving from one locale to another, acquiring the other people necessary during the process, traveling to yet another destination, and ending up smoking sheesha and drinking final cups of coffee at a final destination. The process of this interaction is really the ‘heart of the matter.” This process determines the final results of all transactions. 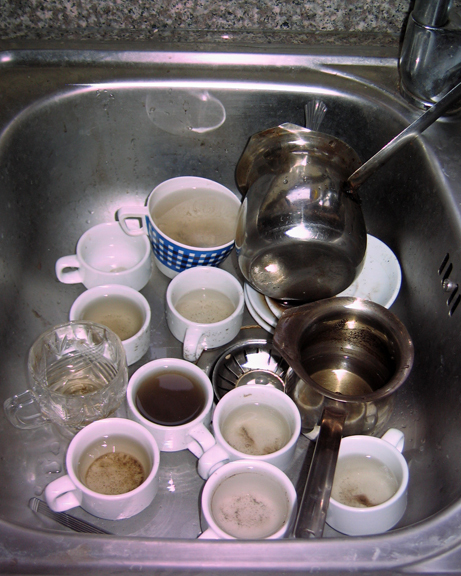 It’s basically an insult to refuse coffee or tea when it is offered by a host, whether at home or in a café. It’s essential for me to welcome any guests in my apartment by serving coffee. Making “acceptable” Turkish coffee is an art. After the coffee boils, it’s necessary to scoop out a tablespoon of the sludge on the top and put it in the cup before adding the coffee. Without this thick film floating on the top the coffee is unacceptable, basically an insult to the guest. 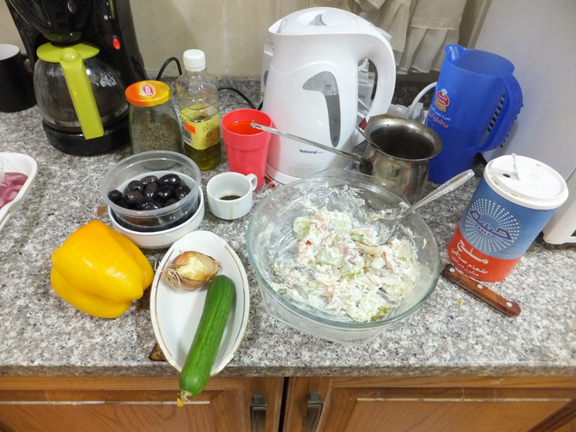 I am still in the process of learning how to make an acceptable cup of Turkish coffee. Thank goodness the cups are small! 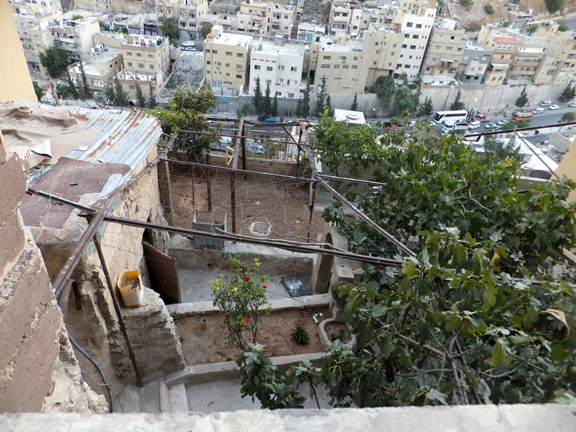 Amman is a city with an intriguing mixture of very old nooks and crannies interspersed with the new. Some of the oldest “hidden away” buildings in Amman have been converted into argileh cafés where elderly gentlemen converge at night on a regular basis and play cards and sit in groups at their respective tables. 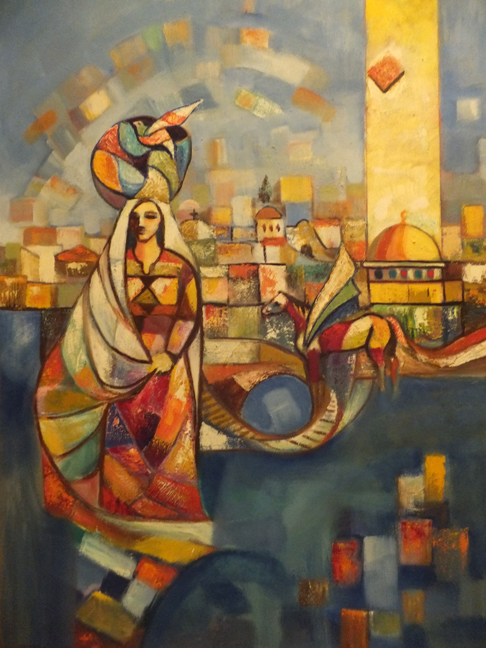 My Palestinian artist friend, Ahmad Canaan – with whom I worked on artistic endeavors twenty years ago in Palestine and the United States – recently left after visiting me for five days. 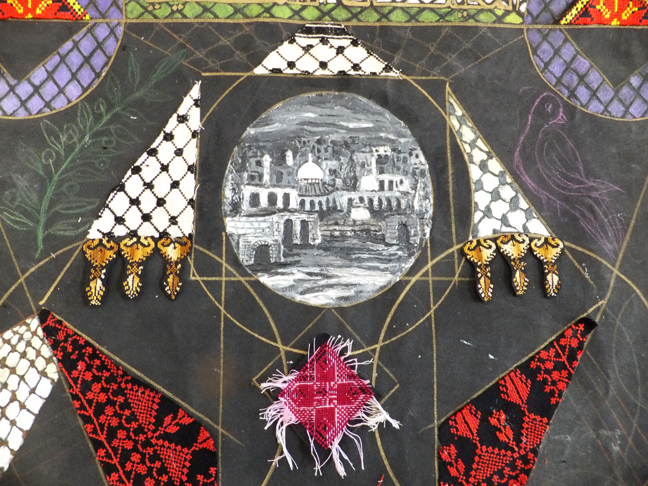 The purpose of his visit was to be a liaison for finding the Palestinian women embroiderers for my art salon, to introduce me to established male artists from whom I will select seven to include their work in the art salon exhibition, and to help secure a gallery space for this exhibition in January. 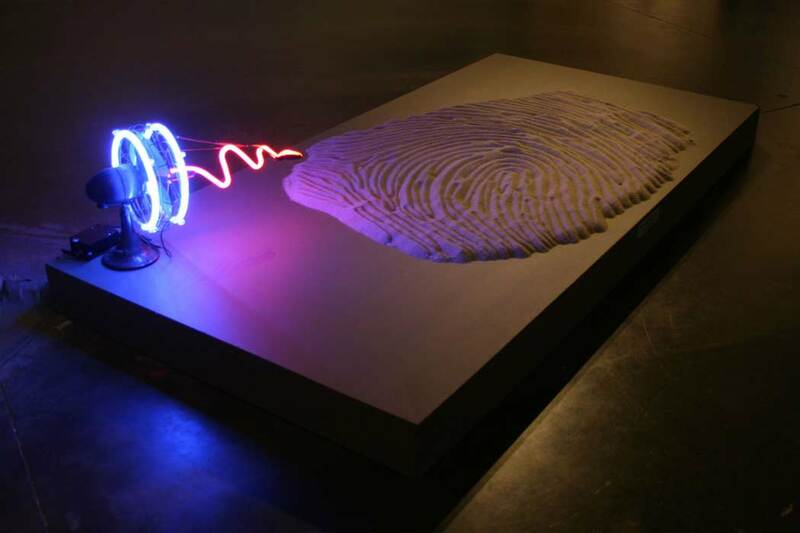 Securing an exhibition at a top notch gallery within a four month time frame is not an easily reached goal – here or anywhere else! 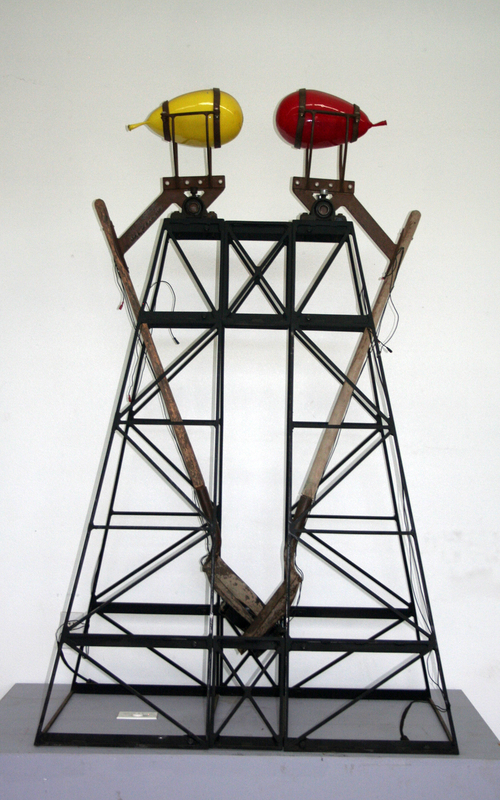 Gallery exhibitions are normally scheduled one to two years in advance. Before Ahmad’s departure today – miracle of miracles – these goals were accomplished! Shortly after Ahmad’s arrival he introduced me to a photographer, Abed Al Raheem Al Arjan, who has volunteered to contribute in major ways to securing excellent press coverage and opportunities for the exhibition. 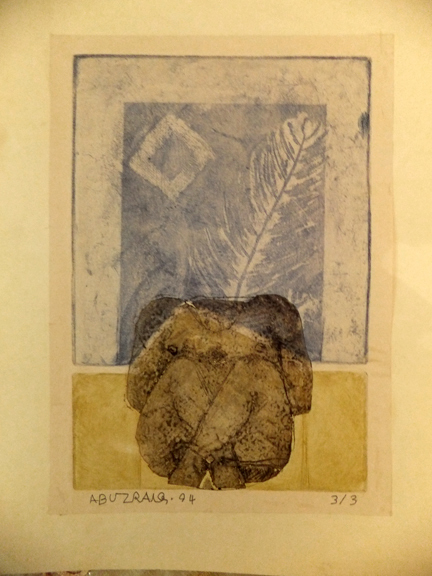 Raheem has personal relationships with everyone in the art world in Jordan, including the press and media throughout the Arab world, and is dedicated to establishing formats for the exhibition of contemporary art. He is also a laudable professional photographer. 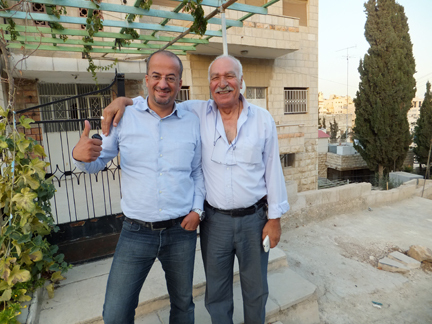 Raheem drove Ahmad and I to Madaba, 20 miles SW of Amman, via the scenic route. We passed through the outskirts of Amman and small villages. On the way we stopped at Hisban, where Raheem’s father and grandfather lived and raised sheep. On the top of the hill is an old castle in disrepair. Luckily, I was able to snap a few photos before my twenty-five year old pocket camera was relegated to the trash. Raheem currently has an exhibition of his photography (and his private art collection) in a Contemporary Art Gallery he established in the Historic Museum in Madaba. After viewing Raheem’s exhibition and the historic museum collection we had coffee, smoked sheesha and had dinner at the newly-constructed restaurant next to the museum: Rakwet Cafe. The restaurant owner, Azziz, also has a restaurant in Paris Circle (I posted photos of his restaurant on my blog previously – the photos of the gorgeous tiles and ceilings) and another restaurant in Downtown Amman. 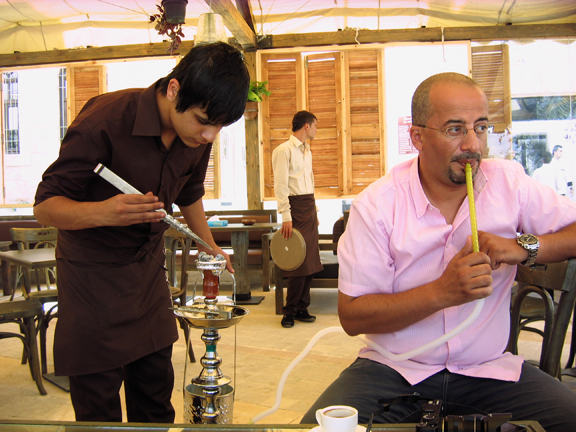 The two owners of the Rakwet Cafe, Azziz and his partner, were being interviewed by Jordan Television while we were smoking sheesha and drinking Turkish coffee. Jordan television also interviewed Raheem. After the filming concluded, we smoked more sheesha and Raheem showed my Family Ties-Occupation Art book, which I had self-published, to Azziz. Azziz expressed interest in publishing my book because, “It shows that all Americans don’t think the same.” He requested to keep the book for a few days and he and his partner generously graced us with a delicious dinner. One more before I buckle down to work…. Tomorrow is the day I buckle down and immerse myself 200% percent in accomplishing my goals. The next photos are of the Friday outdoor souk for clothes, Rainbow Street souk (similar to a Scottsdale craft fair), and the Wild Jordan Cafe – which was a gift from the Queen to Americans. 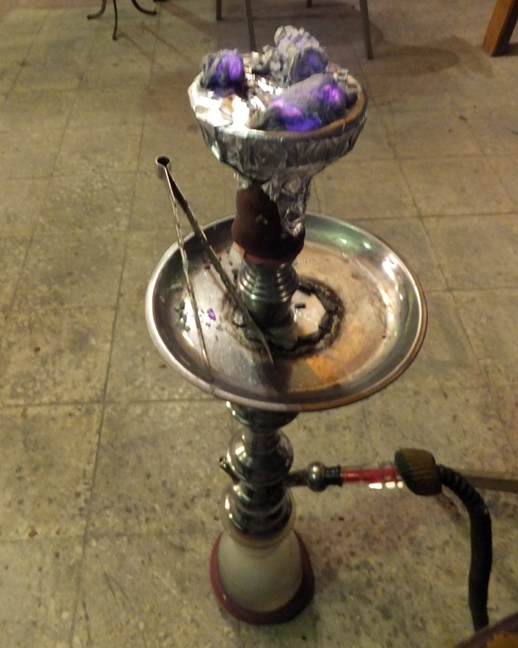 That evening I also revisited the hubbly bubbly lounge with Jose Matinez and Muhammad Abu Aziz in Downtown Amman.